The College of Remote and Offshore Medicine Foundation offers the ICCP programme. It consists of online learning, one week of foundational learning and a final week of board exam test preparation. Online Content: Moodle based, self paced learning. Week 2: Focused board exam preparation week. CoROM provide the largest review course for the American IBSC exam offered outside of the United States. This course is designed for registered paramedics, prehospital nurses and doctors who would like to become a Flight Paramedic or Critical Care Paramedic. Students use the ACEP Critical Care Transport curriculum and online coursework. The International Critical Care Paramedic programme is approved by the International Board for Specialty Certifications. This course gives 24 hours of CME credit. You can find us on their website here. Book now to reserve your place on the course. This deposit will reserve a place on the course. In addition, you will receive online access to CoROM online lessons our selection of YouTube videos focusing on the topics found in the exams. 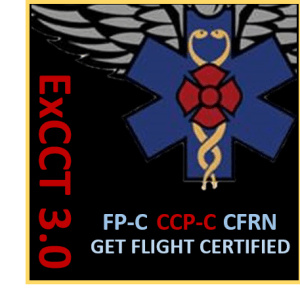 One of our Critical Care instructors, Charles Swearingen, has designed an online training package called Excellence in Critical Care Transport 3.0. Delegates who enrol in this programme increase their chances of passing the exams. Aircraft Fundamentals, Safety and Survival, Trauma Management, Flight Physiology, Advanced Airway Management Techniques, Neurological Emergencies , Critical Cardiac Patient, Respiratory Patient, Toxic Exposures, Obstetrical Emergencies, Neonates, Paediatric, Burn Patients, General Medical Patient and Environmental injuries. Part III: One additional day for sitting the chosen IBSC exams. Optional (1): Study Week Tutoring & discussions around critical care, in a small group of students. Optional (2): Clinical Placement with Hungarian Air Ambulance in Budapest. 5 days of lectures, scenarios and discussions with one experienced instructor. 5 days of lectures, scenarios and discussions with two experienced instructors. On the Saturday after the five days of the Critical Care Transport course, students have the opportunity to take one, two or even three exams. The International Board of Specialty Certification is the US standard for Flight Paramedics, Critical Care Paramedics and Tactical Paramedics. You can find up-to-date information on their website. You may take one, two or three exams on the same day. Each exam takes 2.5 hours. A calculator will be provided to each student for use during the exams. This exams is the 'Pen and Paper' version. It is proctored by IBSC. Pre-Study WeekFive days of tutoring & discussions around critical care, in a small group of students. This week will better prepare the delegate for the Critical Care Paramedic course running the following week. This course will be held at Seabreeze Hotel which is located in the seaside town of Pretty Bay, Malta. You will find many amenities close to hand, including shops, bank, restaurants, coffee shops, bars, and - of course - the beach. This is one of the few sandy beaches in Malta! Birzebbuga is located in the south of the island. This area is quieter than other popular tourist spots in Malta, particularly in winter. The course venue is near the main shipping port of Malta. Terms and conditions related to the course booking. Students will receive confirmation that this course date will take place two months before the course start date. Students are advised to not buy flights until 5 weeks before the course date. Taking part in the CCT Study Week? - In that case, confirmation will be received on September 4th, and flights should not be purchased earlier than that. € 500 secures access to the pre-course study material (online) and reserves your place on the course. The deposit of € 500 is non-refundable. However, should CoROM end up cancelling this course date, due to low enrolment, the deposit and any other payments made will be refunded within two weeks. Payment in full (€1250 plus € 290 for each exam) has to be received 8 weeks in advance of the course date. Students may pay in full earlier (if desired) and a refund of all payments made (minus the deposit of €500). On request, a 'Letter of Invitation' can be received, to support a visa application. If non-EU delegates are not able to obtain an approved visa, they lose their €500 deposit and the remaining €750 can be transferred to a later date. There is NO refund for any tuition paid. We recommend you stay at Seabreeze Hotel during your attendance of this course. Other options are available in Birzebugga and may be found by checking out booking sites such as Booking.com and Expedia. Seabreeze Hotel is a friendly, family-run hotel. You can find a full list of rates on their ﻿﻿website﻿﻿. For your convenience, here are your options at Seabreeze Hotel, using prices quoted for October 2017. - This should be taken only as a guide, to estimate accommodation costs. Rates / taxes may be added. Option A: Share in an apartment (self-catering). Up to 7 persons can share each apartment. Each apartment has three bedrooms. VIEW INFORMATION ABOUT THE FACILITIES AT SEABREEZE HOTEL HERE. Option B: Stay in a hotel room. An excellent preparation for the Critical Care Transport course. Tutor: Small group learning with a Critical Care specialist currently working in the industry. Topics: Focus is on Cardiology, Neonate Care and Paediatric Critical Care. These three topics consistently cause students difficulties during the BCCTPC/IBSC exams. – Other topics can be discussed on request. Format: Small group, discussion based, scenario based. Dates: Monday through Friday on the week prior to the ICCP course. Critical Care Paramedics can enrol for helicopter based clinical placements in Budapest, Hungary. This placement is with the main HEMS station in Hungary. There are around 3-5 calls each day. This is a VFR only station so placements can take place during daylight hours only.